Bitterwseet collection Atrata Sweet is characterized by black cotton base fabric and rich decoration of wide sweet ribbons in two color variations. 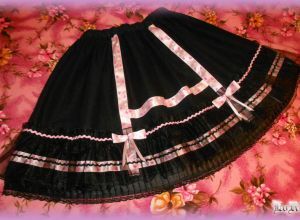 Version Pink is tuned in pink and ornamented with wavy ribbon and bows. The bottom edge consists frill of black cotton, and another one around the perimeter is made of organza. The waist is elastic. Bitterwseet collection Atrata Sweet is characterized by black cotton base fabric and rich decoration of wide sweet ribbons in two color variations. 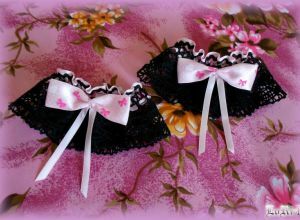 Decorative wristcuffs which are matching the pink version are made ​​from a wide cotton lace and identical ribbon used with the skirt. They are also decorated with an identical bow from ribbons. Bitterwseet collection Atrata Sweet is characterized by black cotton base fabric and rich decoration of wide sweet ribbons in two color variations. Version Violette is tuned in light-purple and ornamented with wavy ribbon and bows of the same color. 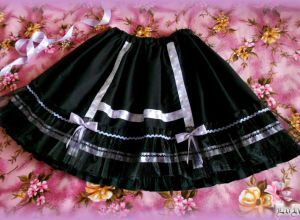 The bottom edge consists frill of black cotton, and another one around the perimeter is made of organza. The waist is elastic. Bitterwseet collection Atrata Sweet is characterized by black cotton base fabric and rich decoration of wide sweet ribbons in two color variations. 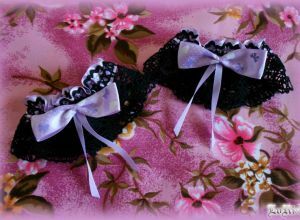 Decorative wristcuffs which are matching the purple version are made ​​from a wide cotton lace and identical ribbon used with the skirt. They are also decorated with an identical bow from ribbons. Bitterwseet collection Atrata Sweet is characterized by black cotton base fabric and rich decoration of wide sweet ribbons in two color variations. Version Prototypink! v0.1 is the first prototype from this collection. 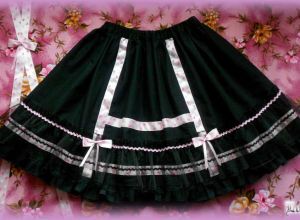 It differs primarily using a wide pleated ribbon with lace instead of the bottom frill, otherwise is almost identical. The waist is also elastic.